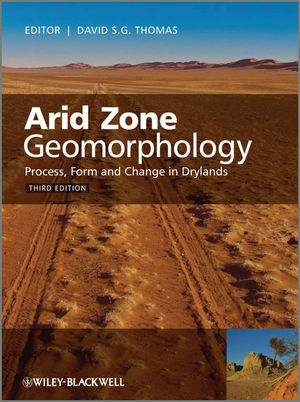 The new edition of Arid Zone Geomorphology aims to encapsulate the advances that have been made in recent years in the investigation and explanation of landforms and geomorphological processes in drylands. Building on the success of the previous two editions, the Third Edition has been completely revised and updated to reflect the latest developments in the field. Whilst this latest edition will remain a comprehensive reference to the subject, the book has been restructured to include regional case studies throughout to enhance student understanding and is clearly defined into five distinct sections; Firstly, the book introduces the reader to Large Scale Controls and Variability in Drylands and then moves on to consider Surface Processes and Characteristics; The Work of Water, The Work of the Wind. The book concludes with a section on Living with Dryland Geomorphology that includes a chapter on geomorphological hazards and the human impact on these environments. Once again, recognised world experts in the field have been invited to contribute chapters in order to present a comprehensive and up-to-date overview of current knowledge about the processes shaping the landscape of deserts and arid regions. In order to broaden the appeal of the Third Edition, the book has been reduced in extent by 100 pages and the Regional chapters have been omitted in favour of the inclusion of key regional case studies throughout the book. The Editor is also considering the inclusion of a supplementary website that could include further images, problems and case studies. David S. G. Thomas is a scientist and geographer. He was born in Buckland Hospital, Dover, Kent, UK, in 1958. He is professor of geography at the University of Oxford, and a professorial fellow of Hertford College, Oxford. I Large-scale controls and variability in drylands. 1 Arid environments: their nature and extent (David S.G. Thomas). 1.1 Geomorphology in arid environments. 1.2 Arid zone distinctiveness and the quest for explanation. 1.3 Arid zones: terminology and definitions. 1.4 The age of aridity on Earth. 1.5 The distribution of arid zones. 1.9 Arid zone geomorphology and people. 1.10 Organisation of this book. 2 Tectonic frameworks (Helen Rendell). 2.2 Tectonic setting of drylands. 2.3 Uplift and erosion, subsidence and sedimentation. 2.5 Existing erosional and depositional records in arid environments. 2.6 Selected examples of the geomorphological impact of active tectonics in arid environments. 3 Climatic frameworks: legacies from the past (David S.G. Thomas and Sallie L. Burrough). 3.2 The significance of arid zone fluctuations in the past. 3.3 Dating arid zone fluctuations. 3.4 Climatic interpretations and issues. 4 Dryland system variability (David S. G. Thomas). 4.1 A framework for dryland diversity. 4.2 Geomonotony: how unvarying are the ‘flat’ drylands of the world? 5 Extraterrestrial arid surface processes (Jonathan Clarke). 5.2 What does ‘aridity’ mean beyond Earth? 5.3 Why should planetary scientists understand terrestrial arid geomorphology? 5.4 What can terrestrial geomorphologists learn from a solar system perspective? II Surface processes and characteristics. 6 Weathering systems (Heather A. Viles). 6.2 What makes arid environments unusual in terms of weathering systems? 6.3 Theoretical underpinnings of weathering systems research. 6.4 Current weathering study methods. 6.5 Linking processes to form in arid weathering systems. 6.6 Explaining the development of weathering landforms in arid environments. 6.7 Weathering rates in arid environments. 6.8 Arid weathering and landscape evolution. 6.9 Scale and arid weathering systems. 7 Desert soils (David L. Dunkerley). 7.1 Introduction: the nature and significance of desert soils. 7.2 Taxonomy of desert soils. 7.3 Some distinctive aspects of desert soil development. 7.4 Stone-mantled surfaces and desert pavements. 7.5 Inorganic seals at the soil surface. 8 Desert crusts and rock coatings (David J. Nash). 8.8 Palaeoenvironmental significance of crusts. 9 Pavements and stone mantles (Julie E. Laity). 9.2 Surface types: hamadas and stony surfaces. 9.3 General theories concerning stony surface formation. 9.5 Processes of pavement formation. 9.6 Processes of clast size reduction in pavements. 9.7 Secondary characteristics of pavement surfaces and regional differences in pavement formation. 9.8 Secondary modifications to pavement surfaces. 9.9 Ecohydrology of pavement surfaces. 9.10 Relative and absolute dating of geomorphic surfaces based on pavement development. 10 Slope systems (John Wainwright and Richard E. Brazier). III The work of water. 11 Runoff generation, overland flow and erosion on hillslopes (John Wainwright and Louise J. Bracken). 11.5 Erosion processes on hillslopes. 12 Distinctiveness and diversity of arid zone river systems (Stephen Tooth and Gerald C. Nanson). 12.2 Distinctiveness of dryland rivers. 12.3 Diversity of dryland rivers. 12.4 Reassessing distinctiveness and diversity. 13 Channel form, flows and sediments of endogenous ephemeral rivers in deserts (Ian Reid and Lynne E. Frostick). 13.2 Rainfall and river discharge. 13.3 Ephemeral river channel geometry. 14 Dryland alluvial fans (Adrian Harvey). 14.1 Introduction: dryland alluvial fans – an overview. 14.2 Process and form on dryland alluvial fans. 14.3 Factors controlling alluvial fan dynamics. 14.5 Discussion: significance of dry-region alluvial fans. 15 Pans, playas and salt lakes (Paul A. Shaw and Rob G. Bryant). 15.1 The nature and occurrence of pans, playas and salt lakes. 15.2 Pan hydrology and hydrochemistry. 15.3 Influences of pan hydrology and hydrochemistry on surface morphology. 15.4 Aeolian processes in pan environments. 15.5 Pans and playas as palaeoenvironmental indicators. 16 Groundwater controls and processes (David J. Nash). 16.2 Groundwater processes in valley and scarp development. 16.3 Groundwater and pan/playa development. 16.4 Groundwater and aeolian processes. IV The work of the wind. 17 Aeolian landscapes and bedforms (David S.G. Thomas). 17.2 Aeolian bedforms: scales and relationships. 17.3 The global distribution of sand seas. 17.4 The global distribution of loess. 17.5 Dynamic aeolian landscapes in the Quaternary period. 18 Sediment mobilisation by the wind (Giles F. S. Wiggs). 18.2 The nature of windflow in deserts.ess elements on velocity profiles. 18.4 Determining the threshold of grain entrainment. 18.5 Surface modifications to entrainment thresholds and transport flux. 18.6 Modes of sediment transport. 18.8 Prediction and measurement of sediment flux. 18.9 The role of turbulence in aeolian sediment transport. 19 Desert dune processes and dynamics (Nick Lancaster). 19.3 Dune types and environments. 19.7 Controls of dune morphology. 20 Desert dust (Richard Washington and Giles S. F. Wiggs). 20.3 Temporal changes in dust. 21 Wind erosion in drylands (Julie E. Laity). 21.2 The physical setting: conditions for wind erosion. V Living with dryland geomorphology. 22 The human impact (Nick Middleton). 22.2 Human impacts on soils. 22.3 Human impacts on sand dunes. 22.4 Human impacts on rivers. 22.5 Cause and effect: the arroyo debate continues. 23 Geomorphological hazards in drylands (Giles F. S. Wiggs). 23.3 The aeolian dust hazard. 23.5 Drainage of inland water bodies. 24 Future climate change and arid zone geomorphology (Richard Washington and David S. G. Thomas). 24.2 Climate change projections: basis and uncertainties. 24.3 Overview of global climate change projections in the context of arid zones. 24.3.1 Methods of establishing climate change impacts in arid zones. 24.4 Climate change and dunes. 24.5 Climate change and dust. 24.6 Climate change and fluvial systems. Supplementary website being considered that may contain further images, problems and case study material.